Skirmish soldiers broadly reflect the roles of the main classes in LOTRO, as you can see from the above matrix. The idea is to choose one that provides skills that your primary alt does not directly have. Often players of all classes opt for the Herbalist simply to provide themselves with additional healing. Similarly, a DPS skirmish soldier such as a Warrior is also a solid, all-round choice. However, as my new character is a Guardian and can maintain threat, I thought it may be useful to have an Archer providing ranged DPS. The idea is to round up the mobs and have the Archer pick off them off while I hold aggro. I was also toying with choosing a Sage or Bannerguard, for their ranged debuff and buff abilities. But I’m not sufficiently knowledgeable of this sort of play style so eventually opted for the Archer. So far, it is proving to be an effective choice, but skirmishes at this level (24) are fairly straight forward. Having re-rolled my Guardian on Laurelin (I now use the Legendary Servers as a “try before you buy” environment), I have access to my shared barter wallet and an ample supply of skirmish marks. Hence my Archer is relatively over powered at present, which is how I like things. 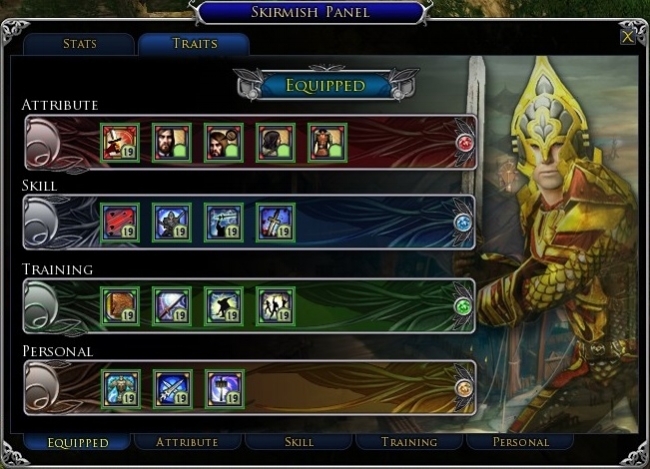 If at higher levels, the Archer proves to be less effective, I have the option of slotting a different role and changing to another play style. Then of course there is the entire issue of running group skirmishes where an eclectic array of soldiers can lead to a very “interesting” experience. Because, despite both the statistical and cosmetic customisations that can be made to a skirmish soldier, they are still a somewhat blunt tool in combat. On occasions they can be used to great effect but more often than not they are chaotic and random. But in an odd way, this is part of their appeal. The other major choice a player is confronted with when equipping a skirmish soldier is exactly what to name them, but such matters are an entirely separate blog post.